VALRICO, Fla. – Marc France and Tom Kleppe fired a 7-under 65 on Sunday to capture the Senior/Mid-Amateur Four-Ball Championship at Buckhorn Springs Golf and Country Club. The pair went wire-to-wire, putting together two bogey-free rounds. France and Kleppe finished the championship at 16-under 128, just two strokes off the lowest round in championship history, 126, set by Joe Graham and AJ Kroger in 2009. Going into final round, France and Kleppe held a one-stroke lead over the field. The duo posted a 9-under 63 in the first round, the low round of the championship. On Sunday, they carded five birdies on the front nine and finished the day with a bogey-free 6-under 65.It was the first Florida State Golf Association Championship win for both France and Kleppe. Two teams finished in a tie for second place at 15-under 129. Jimmy Jones and Chip Brooke recorded an 8-under 64 in the final round, with six birdies on the front nine. Rick Woulfe and Kasey Denesevich shot a bogey-free final round to capture a share of second place. Richard Kerper and Paul Royak took home a tied for fourth place finish, with Don Whittemore and Daniel Debra. In the first round, Kerper recorded a hole-in-one on the sixth hole, while his partner Koyak holed out for an eagle on the par-4 18th hole. They shot a 7-under 65 in the final round. Whittemore and Debra had a bogey-free final round, finishing the day at 6-under 66. Four-Ball is one of the most popular and enjoyable formats in all of golf. Two partners play their own ball into the hole and take the better score for the hole of the two of them. Each team consists of one mid-amateur aged 25-54 and one senior who is 55 or older. There will be separate tees for the mid-amateurs and seniors to accommodate all players. For a look at the past Senior / Mid-Amateur Four-Ball Championship Results, click here. 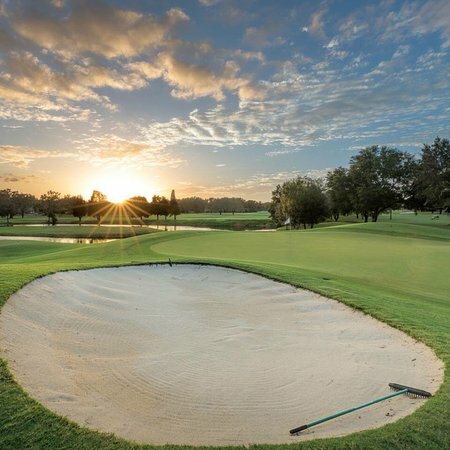 Buckhorn Springs Golf & Country Club is a popular venue for FSGA events in the past, and is the oldest private golf and country club in the Brandon / Valrico area. Since it's opening in 1968, Buckhorn Springs has continually invested to update their clubhouse and course, and it's proven to be a fun test of golf throughout the years. After 18 holes, the number of flights will be based on the number of teams and/or the range of scores. Gift certificates will be awarded to the top finishers in each flight. Only one of the partners per team needs to sign the score card and each score to count on each hole must be individually identifiable. See Rule 31-3. Practice rounds are available five days prior to the event on a space available basis. Practice rounds are restricted to after 12:00 PM on weekends. The cost of a practice round is $35.00 plus tax. Please call 813-689-7766 ext. 6 to reserve a time for a practice round. The place to practice your golf swing is on the driving range. Hitting multiple balls on the golf course is unacceptable. The team of Bob Campione and Doug Snoap won in a three hole playoff and shot 63-68--131 (-13) to capture their 2nd Four-Ball title in 3 years.